Our Abpromise guarantee covers the use of ab41773 in the following tested applications. Ab41773 (at concentrations of 0.25, 0.5 and 1 µg/ml) blocking the labeling of phsopho-nNOS S1416 by ab5583 (1/500) in mouse tissue sections (paraventricular nuclei of the hypotalamus) by immunohistochemistry (frozen sections). A Biotin-conjugated donkey anti-rabbit IgG polyclonal (1/1000) was used as the secondary antibody. Publishing research using ab41773? Please let us know so that we can cite the reference in this datasheet. 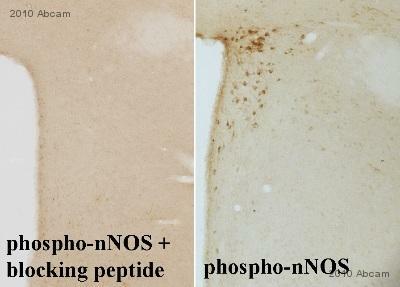 Review text: Peptide used to block the phospho-nNOS S1416 labeling in mouse brain sections, using immunohistochemistry (peroxidase reaction using DAB). It completely neutralized the phospho-nNOS labeling in the three concentrations used (1.0, 0.5 and 0.25 µg/mL). The dilution of the primary antibody was 1:500. Donato J Jr, Frazão R, Fukuda M, Vianna C, Elias CF. Leptin induces phosphorylation of neuronal nitric oxide synthase in defined hypothalamic neurons. Endocrinology. Endocrinology, November 2010, 151(11):0000–0000.